Now seems like the best time to discuss, in detail, my journey to Clay Aiken. The journey begins during American Idol Season 2. This remains the ONLY season that I watched from the very first show to the very last. The reason I watched? Clay Aiken. Actually, Clay Aiken and Ruben Studdard. I was enthralled with this duo - who'd have thunk that America would embrace the larger than life Velvet Teddy Bear and the skinny teacher from North Carolina with the voice of an angel! When I first saw Clay Aiken, I saw a young man, in need of a SERIOUS make over, but who could sing like no other. I didn't see straight or gay - I just saw Clay. As American Idol progressed, I fell in love. I would never have imagined it - it had never happened before and it has not happened since. I fell in love with the voice. I fell in love with the smile. I fell in love with the sparkle in his eye. I fell in love with his presence. I didn't fall in love with straight or gay - I fell in love with Clay. During the finale, I held my breath with the rest of America. I kind of had the outcome figured out, knew it would be Ruben, but I wanted Clay to win the whole thing. I watched as Ryan Seacrest opened that envelope. I watched Clay watching Ruben. I heard the words "Ruben Studdard" and I saw Clay gracefully step back and let Ruben shine. At that moment, I didn't see straight or gay - I saw just Clay, a man who was genuinely proud of and thrilled for his friend. And then I watched. I watched as many interviews and appearances as I possibly could. I watched Clay on Oprah, on The Today Show, on The Early Show, on Ellen, on Jimmy Kimmel Live, on The Tonight Show. I watched him become more comfortable with himself, more confident. Clay is always the best guest on any show - he is funny, charming, caring, humble. Through it all was always that voice, the voice that drew me in from the beginning. I never saw straight or gay - I just saw Clay, growing and becoming the amazing entertainer that he is today. Then I learned. I learned more about UNICEF. I learned more about Autism. I learned more about inclusion. I learned that, while I'm just one person, I can make a difference. I volunteered for Special Olympics. I volunteered at the Food Bank. I walked during the Race for the Cure. I grew to be a more altruistic human being. Clay brought this to me by being an activist for people whose voices are not heard. I never saw straight or gay - I just saw Clay, a man with an amazing heart, who uses his celebrity to bring some good into this world. Then I witnessed. My first Clay Aiken concert was the 2006 Christmas tour. I was blessed to be in attendance at the Merrillville concert (yay me!!!!). What I witnessed was awe inspiring. Clay is so at home on the stage and he wraps his amazing voice and personality around each and every person that room. I have never seen an entertainer more in tune with the audience, interact and feed off them. Each concert is different, because Clay pays as close attention to the crowd as they do to him. The 2007 Summer tour is another high point. I went to five - yes FIVE concerts! Each and every one was different. There is nothing in this world like a Clay Aiken concert - nothing. I never saw straight or gay - I just saw Clay, singing, "dancing", chatting, laughing, joking and walking miles of bus lines. I also saw the dark side. I became an Internet fan after the AI5 finale. I have met some amazing people on the Internet, but I have also seen some of the most vile hatred I have ever experienced. I watched a good man being hounded, harassed, abused, ridiculed and bullied. It was relentless and mind numbing. I cannot imagine having to put up with it, but Clay did with amazing grace and dignity. While the "press" screamed GAY GAY GAY - I never saw it - I just saw Clay and my heart bled for what this gentle man had to endure. Now we come full circle. I read the People Magazine article and watched the Good Morning America interview. I saw an extremely courageous man make a difficult decision for the sake of his child. I felt for an entire family, people I don't even know, when Clay decided it was time to open up about the most private part of his life. I saw and heard the words "I'm gay" but you know what? I just saw Clay - the same man I fell in love with on American Idol, the same man I've listened to, learned from and enjoyed for over five years. I still don't see straight or gay - I just see Clay. Suereu--I love your blog and your way with words. This is exactly what I see. I never look at anyone and think--is that person straight or gay? Sexual orientation is not what defines a person--it is what he does with his life and Clay has proven over and over that he is a good man. Not a good straight man, not a good gay man, just a good man with a wonderful voice! 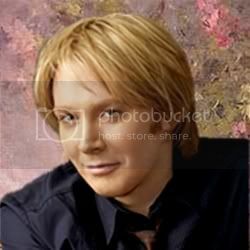 SueRue,thank you for this beautiful blog about Clay Aiken. Your experience is so much like mine. Gay, straight, what difference does it make? None whatsovever! Clay is my once-in-a-lifetime role model of what a human being is capable of if he has a heart of gold and faith in humanity. He has me for life. Sue: Excellent!!! Clay Aiken is still Clay Aiken and that is the same talented, caring, intelligent man he was in 2003. SueReu....your words are just as beautiful as your heart! You speak so eloquently for so many of us who can't find just the right words to say. But we all share that common sentiment......we just see Clay....and how lucky we all are for that! Sue, You have a wonderful way with words! Sue. .wonderful blog. And, I agree.. I never saw straight or gay.. just this beautiful human being with a voice of gold. And, this ability.. gay or straight, to make every single woman to feel that she is beauitufl and worth while. My heart breaks for the harassment he receives, but I applaud his courage, tenacity, and strength. Thank you for these wonderful words Sue! Awesome blog about your journey as a Clay Aiken fan -- a parallel of mine, except I wasn't at Merrilville, LOL! The world is a much better place because of Clay Aiken. His fans have become citizens more in tune with needs around the globe, supporting charities close to Clay, as well as advocating for others. Many thnx for your all your contributtions to the CA fandom! SueReu, you hit the nail on the head for me. I just see Clay Aiken too. Thank you , Sue , Well done . I wish I could put into words my feelings as well as you. I too see Clay Aiken. And I love him. Perfectly said. You have captured the man that Clay Aiken really is, and the man that captured my heart long ago. What a wonder blog. I too only ever saw Clay. A-men, Sue! A frickin' men! I too see Clay Aiken as a man not gay... You truly put into words what I'm thinking... It's the VOICE that we all fell in love with... Excellent blog! A HUGE thank you for your beautiful entry. You wrote what is in my heart and can never translate into the written word. Your journey is much like mine, other than you've been blessed with more concerts! Wow Suereu!!! Your blog was just absolutely wonderful and said it all. It brought me to tears. I adore Clay and will be his fan always and forever. Not only his voice can melt any heart, he gives so much inspiration. I still recall the first time I saw Clay in person. AI Tour from the top stands of the arena, way on the side almost behind the stage where even Ruben looked thin on the big screen. I was in awe that night and I'm still in awe 5 1/2 years later. Clay Aiken lights up a room like no one else can. Yep, I'm still in love. I missed this when it was first posted, but the seniment still rings true. What a wonderful man he is. Thank you for saying it so eloquently. What a beautiful blog! Thank you for sharing! I will always be a fan of Clay Aiken because he is a class act - inside and outside! when did you reach into my head and grab all the words formulated in my brain about clay? it's like i told you yesterday, sue, you have a way with words..."the way you word things...as if you've lived a thousand lives,experienced it all...and are here helping everyone to live, to heal and to deal with life such as it is." amazing blog, sue...thank you for your words. Oh Sue, that just brought me to tears. Its exactly how I feel. I never say straight or gay either. I just saw Clay and that is still all I see. My love for this man just continues to grow. He has so much to offer and he continues to bring joy to us and others. I want everyone to see the man we see. A man with a God given talent like no other. I pray he continues to stay on the path that God has set for him. Again thank you for sharing your love and thoughts with us.